How Do I Reset All Settings Back To Factory Default On My HW-D7000? Resets all system, network, and Smart Hub settings and deletes all user stored BD data. • Remove any disc from the receiver, reset will not work if there is a disc in the receiver, wait for "No Disc" to appear on the front display of the receiver. • "Not Available" will display if a disc is left in the receiver and receiver will not reset. 1. Power on your Blu-ray receiver if it's not already on and and tune your TV to the input where the Blu-ray receiver is connected. 2. 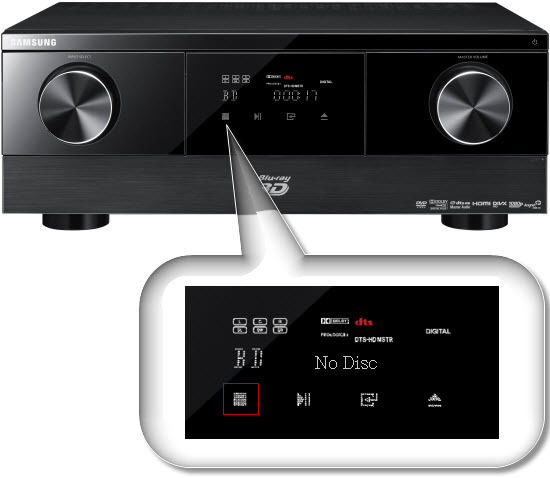 With no disc in the receiver press and hold the Stop button infront of the BD receiver for about 8 seconds or until the front display reads "SETUP". "Resetting all settings to default values..." is displayed on your TV screen as the Blu-ray receiver powers off and resets. NOTE: If you press and hold the stop button on your Blu-ray remote, this does not work. 3. The Blu-ray receiver powers on automatically and displays the initial setup screen, highlight your language and then press Enter. 4. 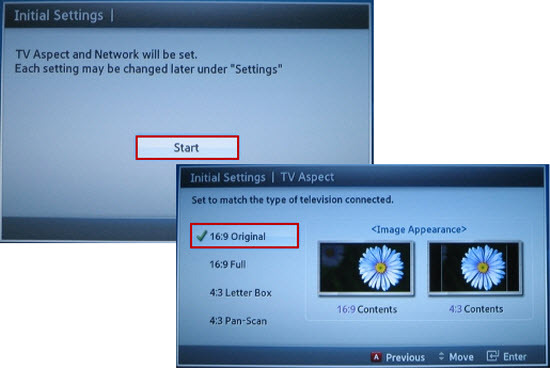 TV Aspect and Network prompt is displayed, "start" is already highlighted, press Enter. 5. The Initial Settings/TV Aspect screen will appear. 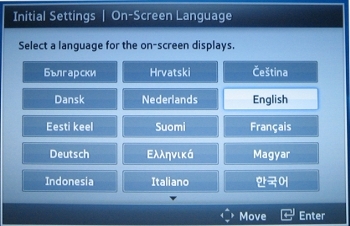 Select the settings appropriate to your TV and preference and then press Enter. • 16:9 Original: Select if your TV is 16:9 (Widescreen). All content will be displayed at the original aspect ratio. Content formatted in 4:3 will be displayed with black bars on the left and right. • 16:9 Full: Select if your TV is 16:9 (Widescreen). All content will fill the full screen. Content formatted in 4:3 will be stretched. • 4:3 Letter Box: Select if your TV is 4:3. All content will be displayed at the original aspect ratio. Content formatted in 16:9 will be displayed with black bars on the top and bottom. • 4:3 Pan-Scan: Select if your TV is 4:3. All content will be displayed at the original aspect ratio. 16:9 content will have the extreme left and right portion cut off. 6. 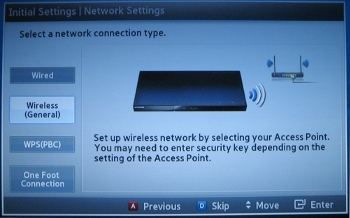 The Network Settings screen appears. Follw the prompts to setup your network or press the blue D button on your BD remote to skip. 7. The home menu is displayed, all settings have been restored to factory default. How Do I Setup My Speakers For 3D Surround Sound On My HT-E6730W? How Do I Perform A Firmware Update On My HT-H5500 Over The Network?